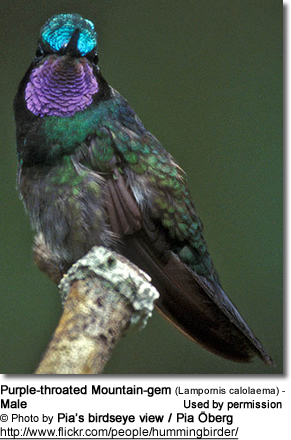 The Purple-throated Mountain-gem (Lampornis calolaema) is a Central American hummingbird. It is related to the White-throated and Gray-tailed Mountain-gems, with which it is sometimes considered conspecific (of, or belonging to, the same species). It occurs naturally in the mountains of southern Nicaragua, northern Costa Rica and western Panama. 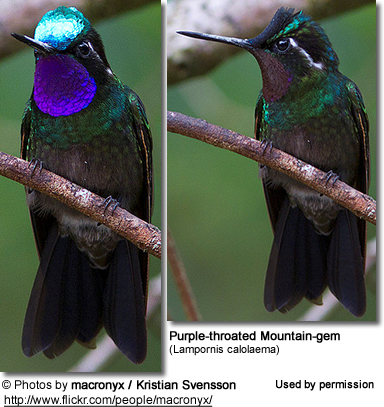 It inhabits forested areas in hilly terrain, and is found at altitudes from 800 m to 2500 m.
The Purple-throated Mountain-gem measures about 10.5 cm in length. The slightly larger male weighs, on average, 6.0 g and the female 4.8 g.
It has a shortish black bill that is slightly curved. 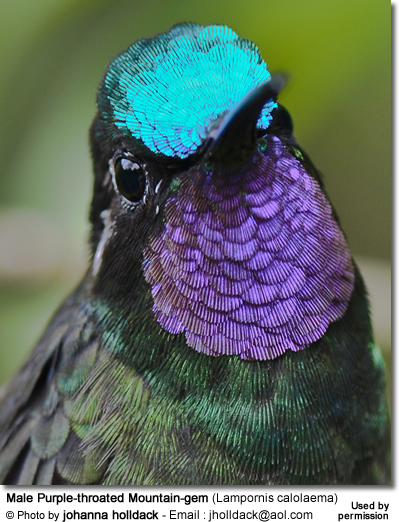 The adult male has a mostly bronze-green plumage, except for the brilliant green crown, purple throat and dark grey tail. The female lacks the bright crown and throat, and has rich cinnamon underparts. Juveniles resemble the female but have buff fringes to the upper plumage. Hummingbirds are solitary in all aspects of life other than breeding; and the male's only involvement in the reproductive process is the actual mating with the female. They neither live nor migrate in flocks; and there is no pair bond for this species. Males court females by flying in a u-shaped pattern in front of them. He will separate from the female immediately after copulation. One male may mate with several females. In all likelihood, the female will also mate with several males. The males do not participate in choosing the nest location, building the nest or raising the chicks. 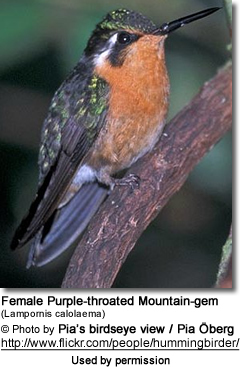 The female Purple-throated Mountaingem is responsible for building the cup-shaped nest out of plant fibers woven together and green moss on the outside for camouflage in a protected location, about 0.7-3.5 m high in a shrub, bush, tree or vine. The nest is lined with soft plant fibers, animal hair and feather down, and the structure is strengthened with spider webbing and other sticky material, giving it an elastic quality to allow it to stretch to double its size as the nestlings grow and require more room. The nest is typically placed on a low, thin horizontal branch. A nest usually contains two white eggs, which are incubated by the female for about 15 - 19 days. The hatchlings are blind, immobile and without any down. The female protects and feeds the chicks with regurgitated food (mostly partially-digested insects since nectar is an insufficient source of protein for the growing chicks). She pushes the food down the chicks' throats with her long bill directly into their stomachs. As is the case with other hummingbird species, the chicks are brooded only the first week or two, and left alone even on cooler nights after about 12 days - probably due to the small nest size. The chicks leave the nest when they are about 20 - 26 days old. The Purple-throated Hummingbirds primarily feed on nectar taken from a variety of brightly colored, scented small flowers of trees, herbs, shrubs and epiphytes, including the epiphytic Ericaceae. They favor flowers with the highest sugar content (often red-colored and tubular-shaped) and seek out, and aggressively protect, those areas containing flowers with high energy nectar. They use their long, extendible, straw-like tongues to retrieve the nectar while hovering with their tails cocked upward as they are licking at the nectar up to 13 times per second. Sometimes they may be seen hanging on the flower while feeding. Many native and cultivated plants on whose flowers these birds feed heavily rely on them for pollination. The mostly tubular-shaped flowers actually exclude most bees and butterflies from feeding on them and, subsequently, from pollinating the plants. They may also visit local hummingbird feeders for some sugar water, or drink out of bird baths or water fountains where they will either hover and sip water as it runs over the edge; or they will perch on the edge and drink - like all the other birds; however, they only remain still for a short moment. They also take some small spiders and insects - important sources of protein particularly needed during the breeding season to ensure the proper development of their young. Insects are often caught in flight (hawking); snatched off leaves or branches, or are taken from spider webs. A nesting female can capture up to 2,000 insects a day. Males establish feeding territories, where they aggressively chase away other males as well as large insects - such as bumblebees and hawk moths - that want to feed in their territory. They use aerial flights and intimidating displays to defend their territories.